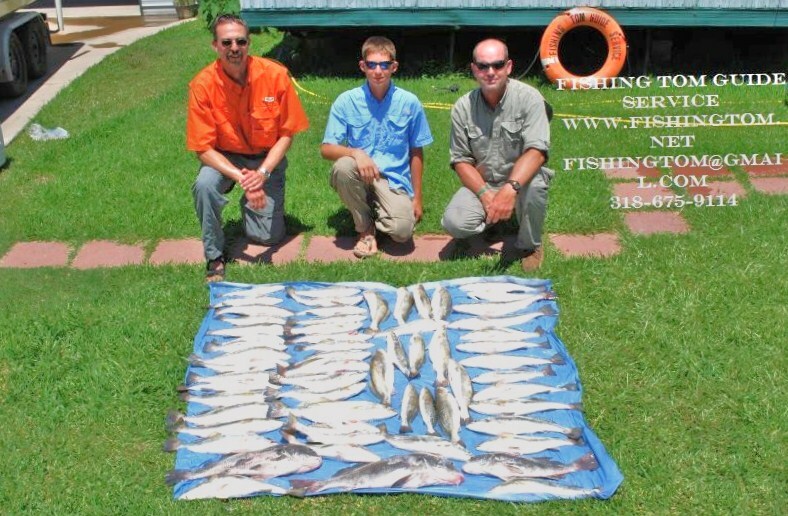 June 28,2010 Ed S. Catches Saltwater Fever for The First Time on Lake Calcasieu!!! June 28,2010 Ed S. of Huntington Tx. Catches Saltwater Fever for The First Time on Lake Calcasieu!!! He’s been a Freshwater Guide for 36 years but today with Friend Tommy A. he caught his first flounder and redfish. It was quite a mixed bag with 2 slams of trout ,redfish, and flounder and a great day for his first Big Lake Saltwater adventure with Captain Tom. 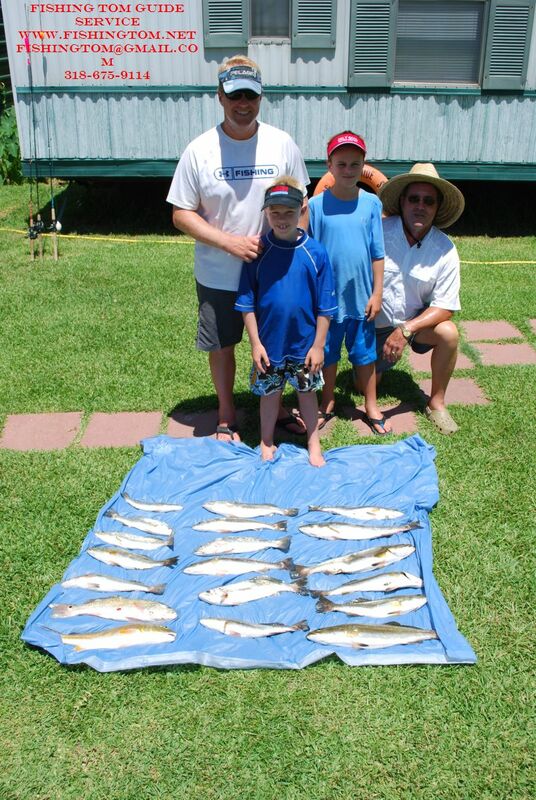 June 27,2010 David L. , Son Micheal, & Grandsons Loch and Walter have a great Family Outing on Lake Calcasieu!!! 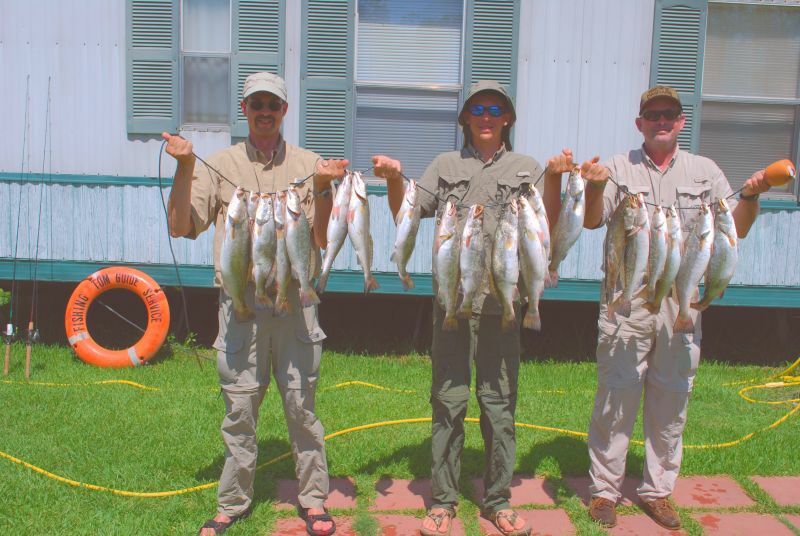 June 27,2010 David L. , Son Micheal, & Grandsons Loch and Walter have a great Family Outing on Lake Calcasieu!!! The day started with a bang along the Big Lake ship channel with live shrimp putting a dozen nice trout and a 2# red in the cooler. Gulp also put a few good ones onboard. Walter had big trout at 23″ about 3 pounds and Loch had big red at 20 inches. We headed to the marsh and put 5 more 2 pound trout and another 2 pound red to finish a great family trip! June 21, 2010 Another Big Lake Limit! For Bill D., Eddie & Keith!!! June 21, 2010 Another Big Lake Limit! For Bill D., Eddie & Keith!!! 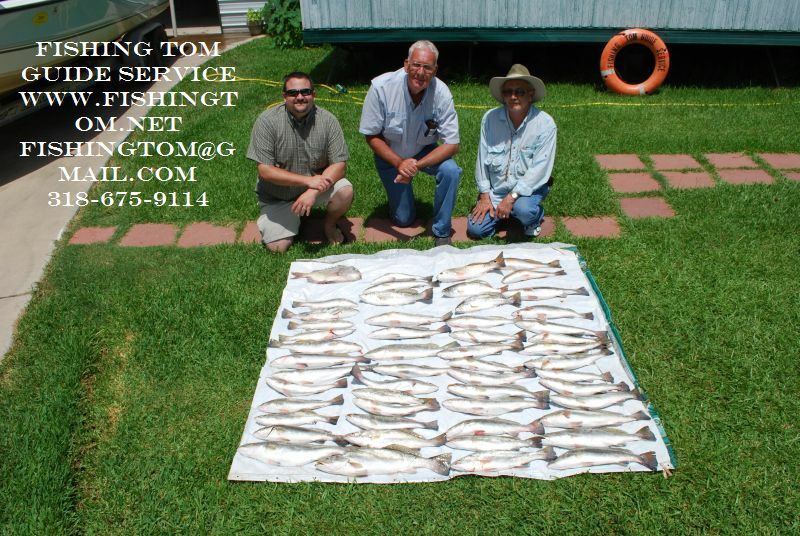 Gulp and Live Shrimp were the key to this incredible Lake Calcasieu Limit. It was fireworks from the first stop(34 in the cooler by 7:30) to the 5 pound red Bill caught on the last cast of the day. June 19,2010 Greg J., Jerry & Son Nick, Day 2 Better than Day 1 on Big Lake!!!! June 19,2010 Greg J., Jerry & Son Nick, Day 2 Better than Day 1 on Big Lake!!! At 5:37 AM the first cast was made by Greg and the first Trout was in the Box. 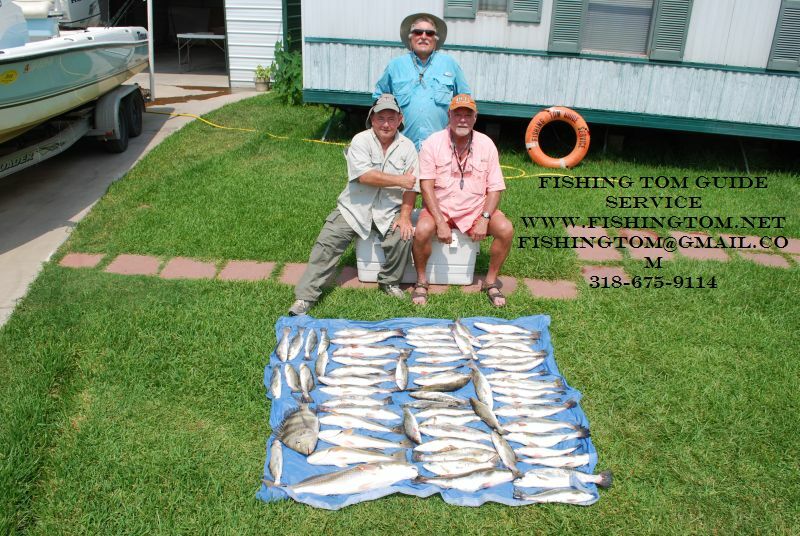 Lots of casts of Gulp Swimming Mullet and at High Noon Trout # 60 filled the Cooler to the top!!! We had a few nice BlackDrum to finish off one Heavy Cooler! June 18, 2010 Greg J. & Friends Fight high winds to Hook 20 Big Lake Beauties!!! June 18, 2010 Greg J. & Friends Fight high winds to Hook 20 Big Lake Beauties!!! All on Berkley Gulp and all but 1 was over 2 pounds. What a Stringer!!!!. June 17,2010 Day 2 Of Trout Slam!!!!! June 17,2010 Day 2 Of Trout Slam!!!!! 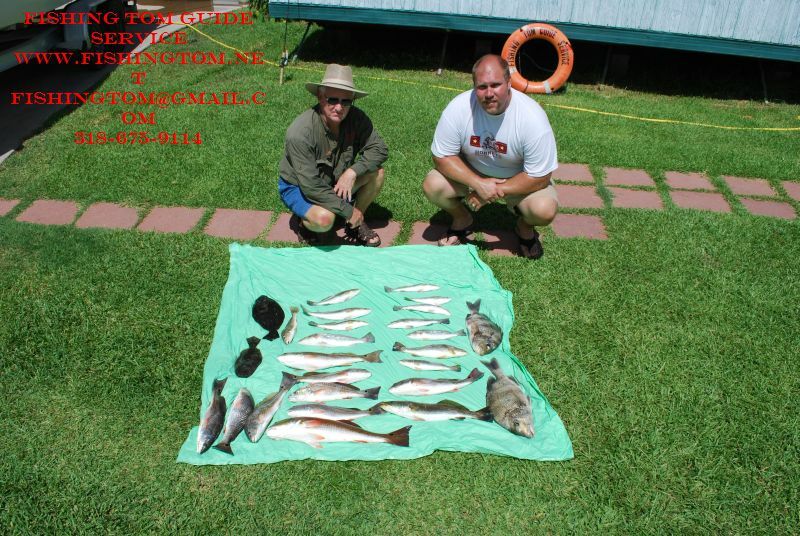 Larry F. ,Jerry , & Scott used pearl Swimming Mullet to Slam another limit of incredible Lake Calcasieu Trout.